Coffee jelly is a common dessert in Asia and it's very easy to prepare, low in calories and free from any artificial flavours or additives. It's January and that means a lot of us are eating healthy and trying to take off Christmas weight; but at least I get to look at some of the reasons why that's necessary! 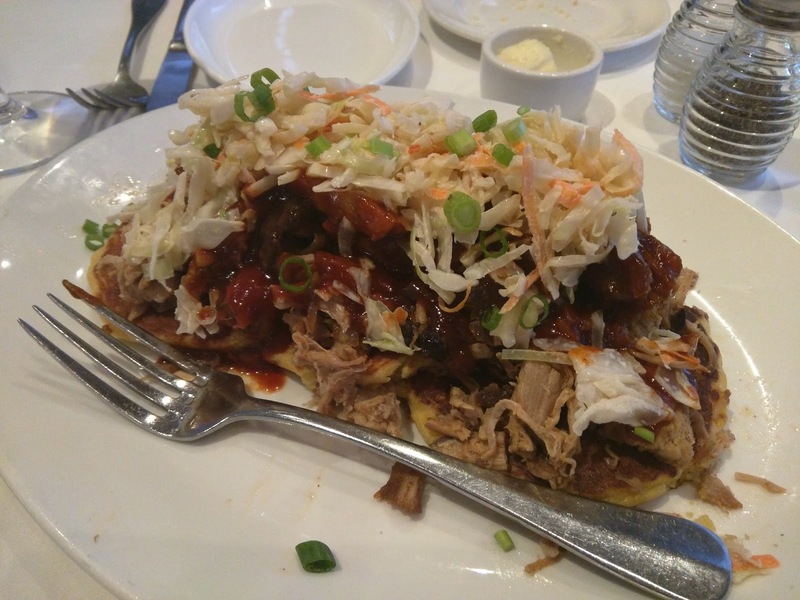 South City Kitchen is a high end Southern restaurant in Atlanta offering traditional local dishes with a flourish. We went in a large group and had a set menu but it meant I got to see what everyone had to eat. The food in Atlanta is definitely "hearty" and harks back to days when Georgia was an agricultural center of the South. It's sticky gooey comfort food as far as the eye can see and while I might need to run a few extra miles this month it sure was worth it! 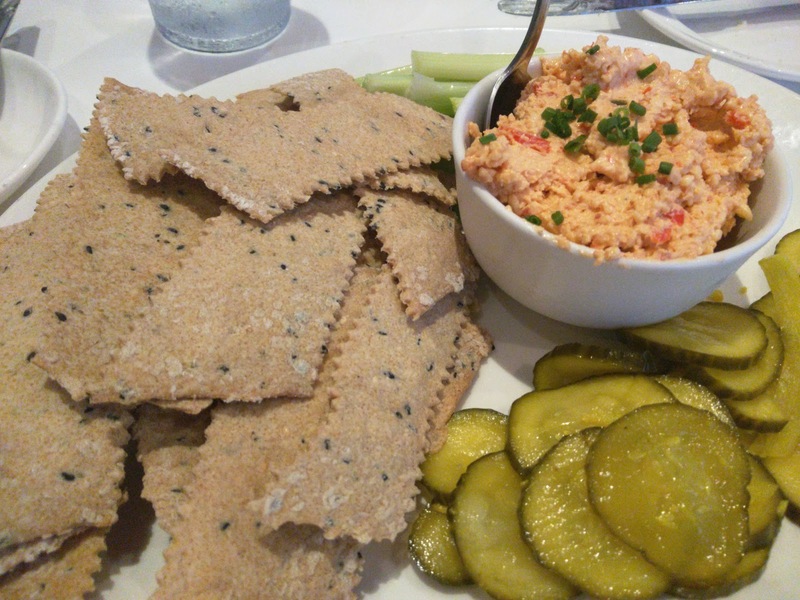 Pimento cheese is one of those American things I don't understand. Sharp cheese is mixed with bell peppers and mayonnaise. This is a good rendition of the dish but I think this requires a little nostalgia. The pickles and benne seed crackers were very good though. 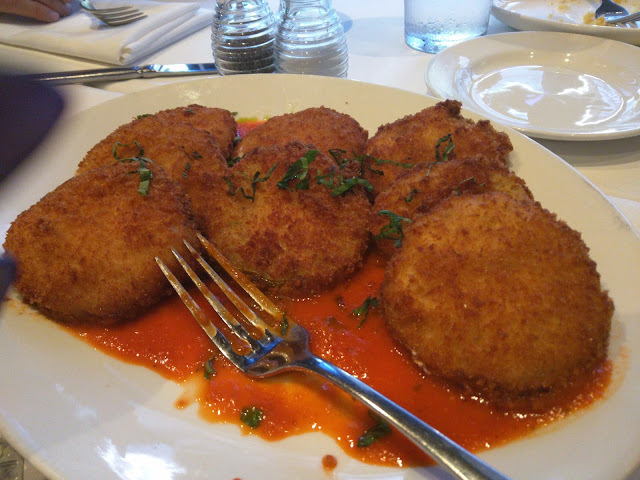 Stuffed with goat cheese and served with a sweet red pepper coulis this is a morish vegetarian delight that pairs great with cold beer or white wine. All the fried food in Atlanta really needs some greens to cut through it. 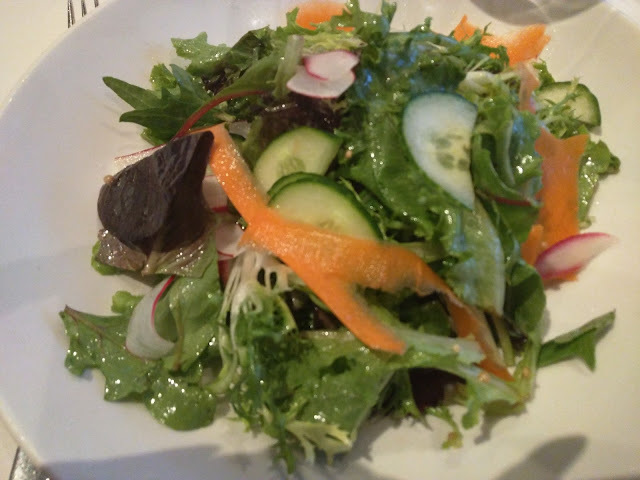 This was a good simple side salad with fresh vegetables and a light vinaigrette. Boy do they know how to make fried chicken in these parts. Brined in a buttermilk bath overnight and then dipped in a slightly spicy batter then fried. The chicken was crisp and the oil not too heavy, great with mash and beans for a simple Southern delight. 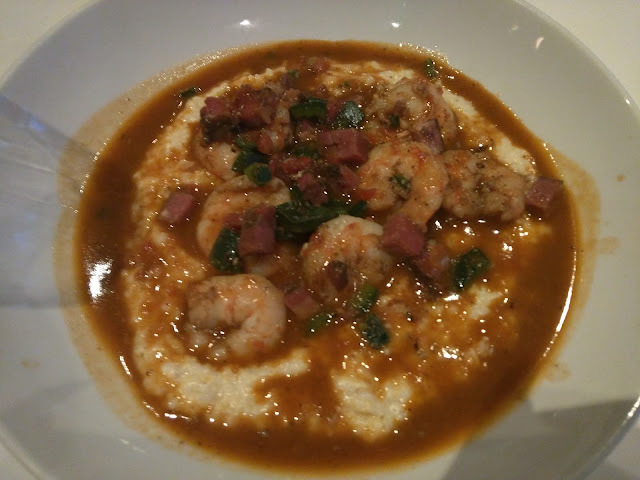 Shrimp and grits is another very American traditional dish that was unknowns to me before moving to the US. Grits are a corn based porridge similar in taste and texture to polenta made by boiling ground corn. Some grits is made with "hominy" which are corn kernels treated with alkali and give a slightly chewy texture. Shrimp and grits comes with grilled or fried prawns and a gravy often made with pork belly or porcetta. 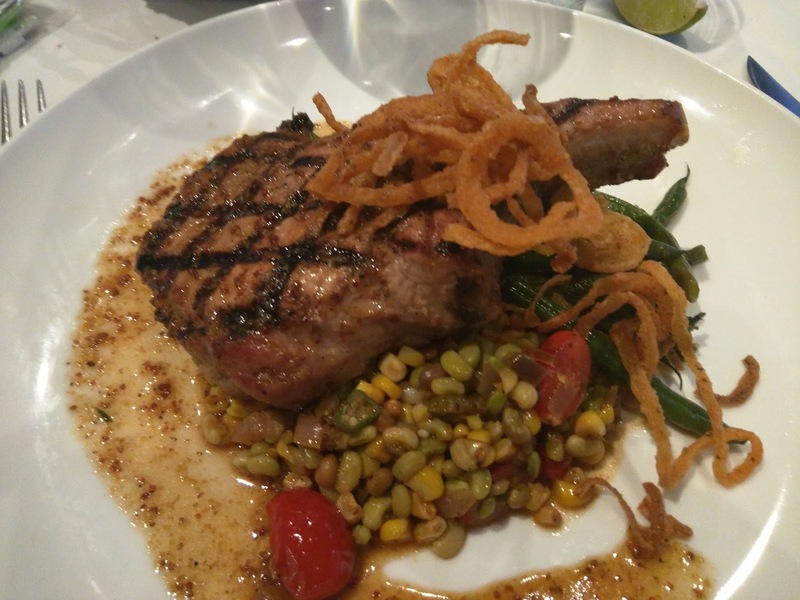 A very hearty double thick pork chop was basted with a Georgia peach relish and grilled to perfection served over a succotash of corn and beans. The sweet glaze was to die for and this dish was just amazing but we could have easily shared one between two people. This was a main meal sized version of what is usually an appetiser so the serving size may vary. The hoe cake is rather like a vegetable tortilla that soaks up the juices from the meat. Served with a sticky BBQ sauce and cut through with the tangy slaw. Yum. 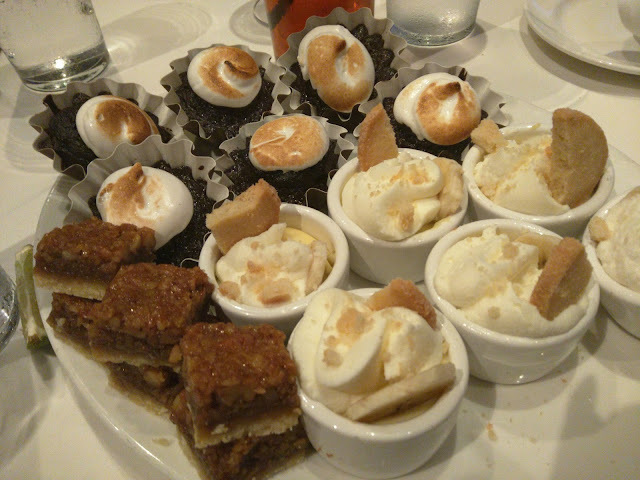 We got a sampler plate of tiny versions of these desserts but I'm not going to lie after smothered chops and fried chicken most of us could not eat dessert and a lot of the plate went lonely. Sticky and very sweet desserts seem to be common in the south but I love the user of Buttermilk and custards which give a surprising lightness and destract from all the sugar. 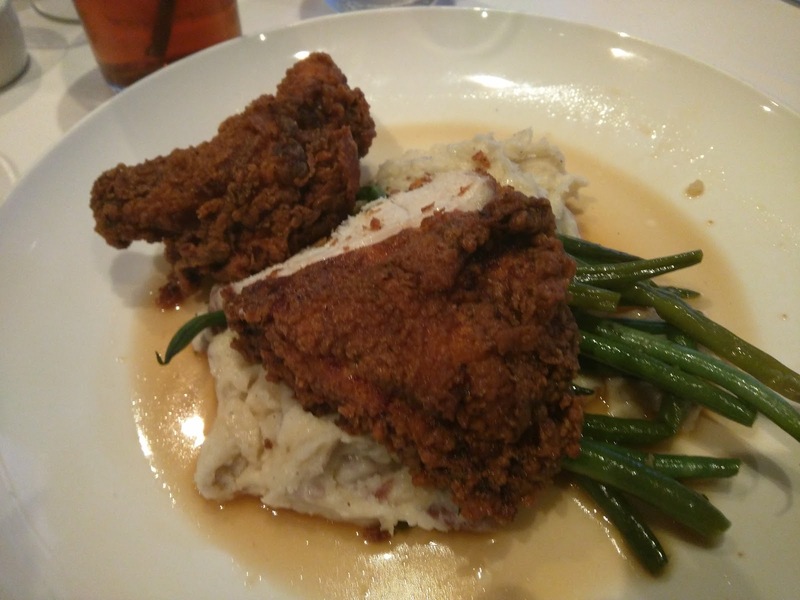 South City Kitchen came well recommended by many and to get a good sample of Southern cuisine it was a great choice. The restaurant was buzzing but the service was excellent. I would definitely avoid eating lunch before hand though. You might have noticed a bit of a radio silence, but for me that usually means lots of travel so there's lots of blogging to catch up on! Atlanta is a surprising delight, a beacon of society and culture in the south filled with technology and media companies that keep the city vibrant. 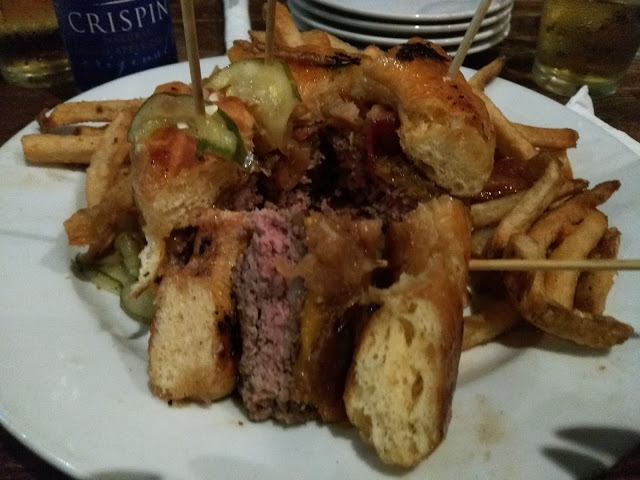 I was surprised to find how fantastic the food and bars were in Atlanta, seemingly everywhere we turned. Taking a day out from a busy conference and convention schedule I signed up for a walking tour of Midtown restaurants. I found Peachtree Tours through TripAdvisor and the reviews were great, for a reason! John is a local resident who lives in Midtown and has great local knowledge of the area and the local eateries. Buying tickets was easy and John was very friendly and in contact early to talk to me about our needs; he was even able to accomodate a last minute ticket for a friend who joined. We met at the iconic Fox Theatre in Midtown and I was happy to see that the group was reasonably small. This makes dining and chatting with the group relatively easy and the starting point is easily accessible from local hotels. 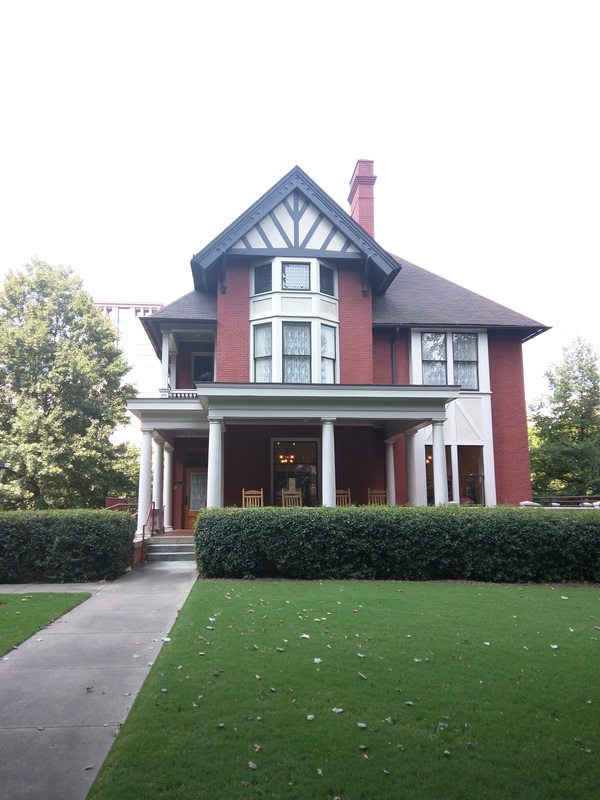 As we walked to our first dining destinations John took some time to talk about the local architecture and history of Atlanta. While we didn't stop to eat at the Georgian we got some great history on the building including this ballroom which was the site of Margaret Mitchell's society debut. Sadly we were not able to stay on but it was great to see signs for Taste of Atlanta. Atlanta is a great destination for food and drinks and as a foreigner it was great to see a lot of local and Southern food highlighted throughout the city. Firstly we stopped for the Most American Thing - a bacon cheese burger made with donuts for buns. Surprisingly it wasn't as overwhelming as I expected but I'm told the secret is that they use an Asian style donut less sweet than most American donuts. We shared burgers though, with many dishes to come throughout the day there was no need to fill up early! At each stop we had a drink pairing as well, not so much to distract during the walk but enough to wash down the meal. In this case it was a Crispin Apple cider perfect in the warm Atlanta weather. John focussed on some great Southern traditions and as a foreigner exploring the food scene this was a great insight into local traditions. Here we were given boiled peanuts in bourbon and coca cola - Atlanta is the home of Coca Cola and they truly own the town. This was once a working man's treat and the cafe balanced it out with a fresh kale salad. What a great slice of Southern treat! Fried green tomatoes and a fresh Moscow Mule on a delightful patio with plenty of opportunity for crowd watching. Einstein's is an Atlanta instutation and I can see why. This is the perfect lazy Sunday destination or celebration meal and the high class rendition of these Southern favourites was just perfect. My only wish? That we'd had a sweet tea cocktail to wash it down. Fried chicken and champagne? Why the hell not indeed! I probably wouldn't have thought about this combination but it just works. For me this really represents that great cultural mix that Atlanta has, a little bit posh but a little bit wild and really into great chicken. The butter milk chicken came with traditional sides like cornbread, greens and potatoes and came washed down with a generous glass of Classique Prodige Blanc de Blanc NV. This could have been a meal in itself and I'm glad the portion wasn't bigger. Fried chicken and champagne might just become the new meal of the Southern fashionista. The branding on the restaurant could do with a little work, I couldn't get any shot where the name of the restaurant and their amusing slogan went side by side. What a missed opportunity for free instagram advertising! On top of this the "wine dive" name is a little odd, people who like dive bars don't really drink wine. I loved the decor though all rustic wood covered in mug shots of famous people - Jimi Hendrix and Al Capone to name a couple. This is definitely a restaurant with potential that needs a new executive manager to really drive the opportunity to target women with disposable income. If there is one thing I miss about Australia it is the cafe culture. Wide patio dining and classic European coffee couture are sadly missing in California. Intermezzo really harks to a lazy afternoon in Florence or even Melbourne. Great espresso drinks and a seemingly endless liqueur selection go hand in hand with a pastry cabinet that is just to die for. Traditional Italian pastries, American classic cakes and pies and sticky Southern delights all feature. Everyone was delighted with their pastries and a coffee was just perfect to cap it off. For my friend's birthday we even got a candle on her cake and had a birthday sing song. How lovely! But wait there's more! Just when you think you couldn't eat another bite John stopped at the bakery for us to take home some treats. Asian bakeries are high on our list of favourites and this shop had a great mix of sweet and savoury buns and delightful hand crafted desserts. This gave us a better than average breakfast the next day! All in all it was a marvellous food tour and very involved compared to some of those I've been on. We covered quite a bit of distance in Midtown Atlanta, but it was not strenuous and I was able to easily traverse without impact on a bad leg. Truthfully it was good to walk off some of the food so that you didn't feel lethargic by the end of the tour. I would advise if you have older members in your party that taking the tour in the colder months might be sensible. There was plenty of history, culture and sites as well as the food and the portions and drinks were very generous for the price. As well as the stores and restaurants we visited we stopped to talk about iconic eateries not on the tour and I had plenty of ideas of where else we could go while visiting. A highly highly recommended event for the food traveller.